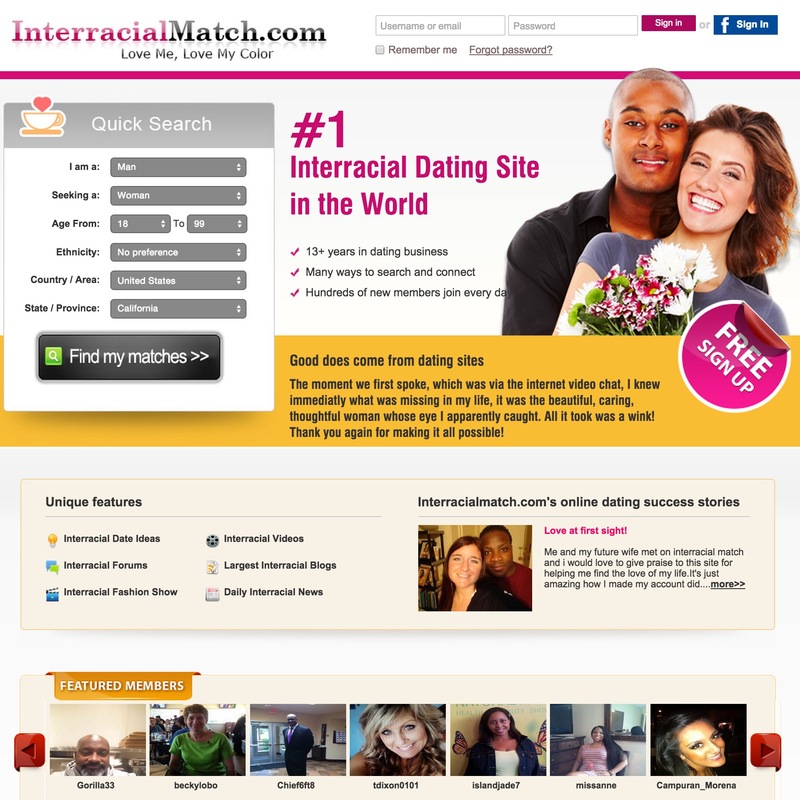 Interracial Match is our #1 choice for interracial dating. Being in this business for more than thirteen years, the site offers an online portal with an easy process for getting started. After placing your free profile, you can start meeting people of different cultures and backgrounds, who are also interested in interracial dating. After creating a free profile, you can start searching for other members, send them winks and also reply to emails or instant messages that you receive. Later, you can upgrade to the gold membership and enjoy many other features of the site. You can access the Free Sign up window for creating your profile. It only takes a few minutes, where you have to sketch out your lifestyle and the aspects that are important to you in interracial relationships. The site offers a questionnaire that will help highlight your characteristics, interests and your personality. You can also add a short narrative and then upload your photos. All members can create a free profile and upload photos. All other standard and gold members can view profiles of free members. Free members can send winks to others and also form a favorites list. They can receive emails from Gold members and respond to them, but they cannot initiate an email. While searching, they can only use a basic search, with gender, age range, region, whereas only premium members can access other criteria. Basic members can add a maximum of 26 photos. Apart from the basic, free membership, you have three options. You can opt for a six-month membership of $119.95; a three-month membership by paying $74.95 or a one month membership of $39.95. All this can be paid using PayPal or your credit card, but you need to be aware that the memberships get automatically renewed, unless you turn it off. Gold members are classified as recommended members, as they are considered to be the more serious ones with regard to love, marriage, romance and so on. Gold members can initiate emails, set wink filters, have security options for their profile and their photos. They can also send birthday cards and view both reverse and compatible matches. They can also know the last login times of other members and search with advanced keywords, postal codes, cities and other criteria. You can also earn a free gold membership by sharing some dating advice or safety tips or offer quality suggestions, write a promotional article or share the site on media sites, recommend a partnership with other similar sites and so on. If you want to make a quick search, you can fill in your details, such as whether you are a man, woman or couple and the age group, ethnicity preference, country and state of your potential partner. This can be quickly accessed from the home page and you can start searching for matches immediately. There are many interesting date ideas from the members categorized under Food and Drink, Art and Culture, Wine Bar, Out & About and several others. You can browse through these ideas once you are logged in as a member of the site. Members can go through tips and dating advice in order to date safely. All measures are taken for safeguarding private information, so that members can feel secure while using the site. The blogs on the site offer a great opportunity for members to share their experiences and other interests with others. It offers a great means of ice breaking and getting acquainted with others. In addition, you can add your blog to social networking sites, such as Facebook or Twitter. There are various interesting topics, such as Most Embarrassing date, First day as a member and many others. The various forums offer a playground for discussing various topics and you can click on any of the threads to follow them and post your own comments. There are various topics, such as Health, Friendship, Romance, Big Beautiful Women and several others. Members can also get tips on how to post their profiles and photos, first date advice, advance date advice, safety tips as well as read several success stories on the site. The site is unique, as it offers a support team on a 24/7 basis along with a thorough member verification system. Members can get help from a live counselor on all interracial problems, advice or relationship guidance. As with any other dating site, there is no promise that your information will remain secure, so members need to take care not to disclose any personal information. Interracial Match comes high recommended as one of the top dating sites in this niche category. The site is a large, comprehensive one with plenty of services to help you mingle with other members, and find love, romance or permanent relationships with various members of different cultures, countries and ethnicities.